The Bowl – Serves a myriad of purposes; here you'll find the most variation between glasses. 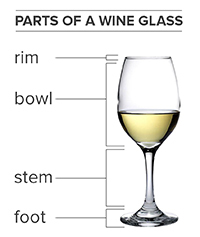 The bowls of all wine glasses will be tapered upward with a slightly narrower opening at the top than at the bottom. This shape helps to capture and distribute the wine's aroma toward your mouth and nose. Wine glasses are typically made out of glass or crystal – but what's the difference? All crystal is glass, but not all glass is crystal. In general, it is the lead content of glass that is the main determinant in the classification of something as either glass or crystal. The presence of lead softens the glass in crystal, therefore making it more easily cut and engraved. It also increases the weight of the glass and causes the glass to diffract light; traditional glass on the other hand is generally lighter in weight than crystal, and light will not diffract through it. In traditional lead glassware, the lead has a tendency to leach out of the crystal. To combat this, today's crystal glass is typically unleaded. Unleaded crystal uses barium carbonate and zinc and titanium oxides to replace the traditional lead oxide that's often found in crystal glassware. These glasses feature similar properties as lead crystal, such as temperature control and the ability to accentuate the aroma and flavors of wine. They also feature a similar refractive index to lead crystal, but are lighter in weight. 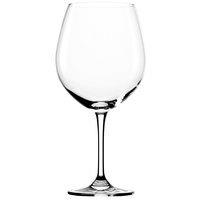 Although the highest quality crystal glasses are thought to provide a better wine tasting experience, the high cost of these glasses often prevents many from purchasing them. They are also very fragile, so you will experience a higher replacement cost than with thicker plain glass.